Short Aluminum Fences Are Great For Marking Property Lines and Protecting Kids Or Pets. Are you looking for an affordable and resilient fence for your home or office? Aluminum fencing is a great option for just about anywhere. Here at Ware Fencing, we offer a variety of fencing options to our clients, and our aluminum fence installation in Crowley and Fort Worth, TX is particularly popular. If you are interested in adding a durable aluminum fence to your property, give us a call today at 817-948-4503. When you are choosing a fence for your home, it is important to learn the benefits and disadvantages of the fence you are interested in. Lucky for you, aluminum fencing comes with a wide selection of benefits! To begin, aluminum fencing is one of the most affordable fencing options that isn’t wood. Aluminum is also more resistant to rust than iron, and of course resistant to rot. Another great perk is the sloping ability aluminum fences have. Essentially, an aluminum fence can be installed on uneven ground without staggering the panels. This provides a polished appearance and an even spacing between the fence and the ground for the entire length of the fence. 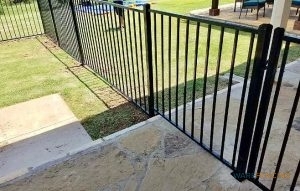 Furthermore, your aluminum fence is perfect for enclosing your pool or yard, which keeps your kids and pets safe. We also offer a wide range of color options for aluminum fences, though black is typically the most popular. Aluminum Fences Are Available In Taller Styles As Well. At Ware Fencing, we work hard to make sure our clients get exactly what they are looking for in a fence. We even offer custom fence options if you are searching for something specific. Aluminum fencing is quickly becoming popular in commercial and residential areas alike as the most affordable and durable fencing option on the market. In fact, with professional installation from our professionals, you can expect your fence to last for decades to come. If you are interested in investing in your own aluminum fence installation in Crowley and Fort Worth, TX and the surrounding areas, please give us a call at 817-948-4503 today! Our experts are happy to help you through every step of the fencing process, from the very first phone call. We’ll help you pick the ideal fence for your budget, style, and needs. Updated on September 20, 2018 at 8:50 am by Ware Fencing.